In this anthology, you'll find seventeen tales of conflict and heroism, exploration and discovery, endurance and triumph. Flee the apocalypse of modern-day Earth, fly a fighter in the cold emptiness of deep space, and find new life on the distant shores of an alien world. You might even discover something about yourself as each author opens a window on the soul of mankind. Start listening to this collection and take your first steps into tomorrow. Travel the cosmos to find amazing adventure. 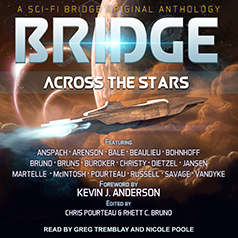 Walk beside unforgettable characters on the bridge across the stars . . .